Gendarme has launched a new fragrance, Gendarme Sky, "Bright, but mysterious.... and forever, long lasting". An all new fragrance concept featuring: Top notes of sparkling bergamot, sweet lime, green lemon cardamom and cognac; mid-notes of Magnolia flower and Asian pepper oil and a dry down of warm woods and luxurious Spanish moss. 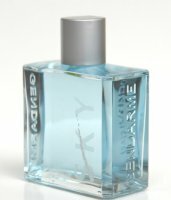 Gendarme Sky is available now at gendarme, in 100 ($69) or 200 ($95) ml Eau de Toilette.